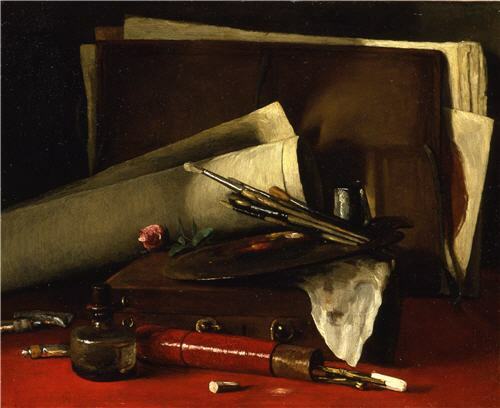 This still life depicts the materials used in its making – including palette and brushes, tubes of paint, a portfolio of drawings, an inkwell and a paintbox. The French artist Bonvin painted the objects in the direct and uncompromisingly physical manner of the Realist painters of the mid-19th century. However, the painting was also inspired by Jean-Baptiste Chardin whose Attributes of Painting and Sculpture dates from 1728. Bonvin’s canvas is therefore both a truthful study of artfully-arranged objects and an allegory of the art of painting.